Join us for Winter Camp weekend at the Zoo! Ready for a winter break? Send the kids to North Georgia Zoo! Campers will be getting up close & personal with a variety of animals. They will enjoy learning about animals, creating enrichment, helping with training and much more! Campers will get to be active, growing and learning. We send them home with everlasting memories! Don't worry we have both indoor and outdoor activities so we won't let them get too cold. Pack for muddy or cold fun though! Campers can choose 1 day or 2 days. We also offer a overnight option. For ages 8+. Teens and younger kids on the same weekend. They will be split up for activities. Overnight accommodations areas would be separate for boys and girls. 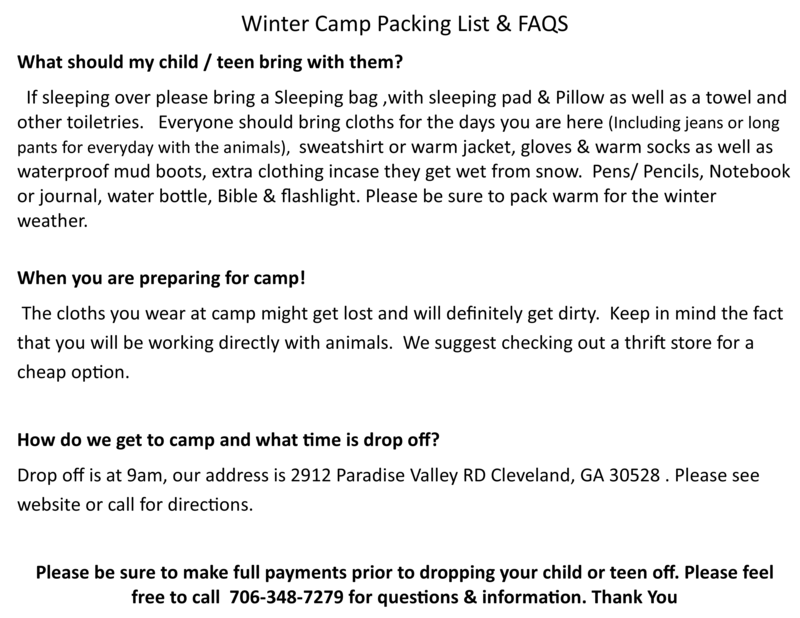 For a list of what to pack, click here. Check out our Summer Options as well! Day Camp & Overnight Teen Camp available! Click button for more info. *Cold Weather, we just purchased the new land that has a building on it that can be heated with lots of space to do indoor animal training, activities and games so that will be what we will be working out of. It is still a basic empty building but perfect for the start of a new camp tradition. Over time we will add more to the building (including indoor bathrooms and running water) but for now it is a great large indoor space for lots of educational and fun activities and learning to happen. It will also serve as the sleep over area for some of the campers. If weather is concerning, may look at just dropping off kids later or picking up earlier. We can be flexible.